When Dr. Joy Poskozim wanted to redo her dental practice’s website, she turned to our Senior Executive, Kate Alpert, whom she met at a local networking group. 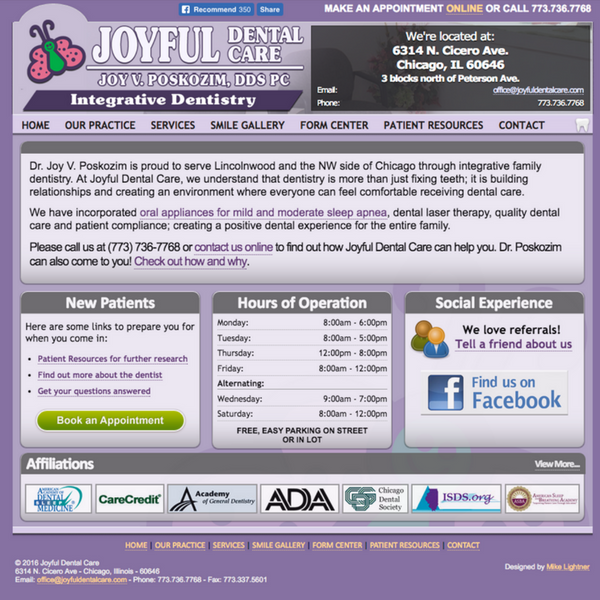 Joy’s practice, Joyful Dental, is unique in that she practices integrative dentistry, which is a more holistic approach, and has a passion for making her patients feel comfortable while they’re at appointments. She cares for her patients and makes house calls to those who are unable to come into the office, such as the elderly. 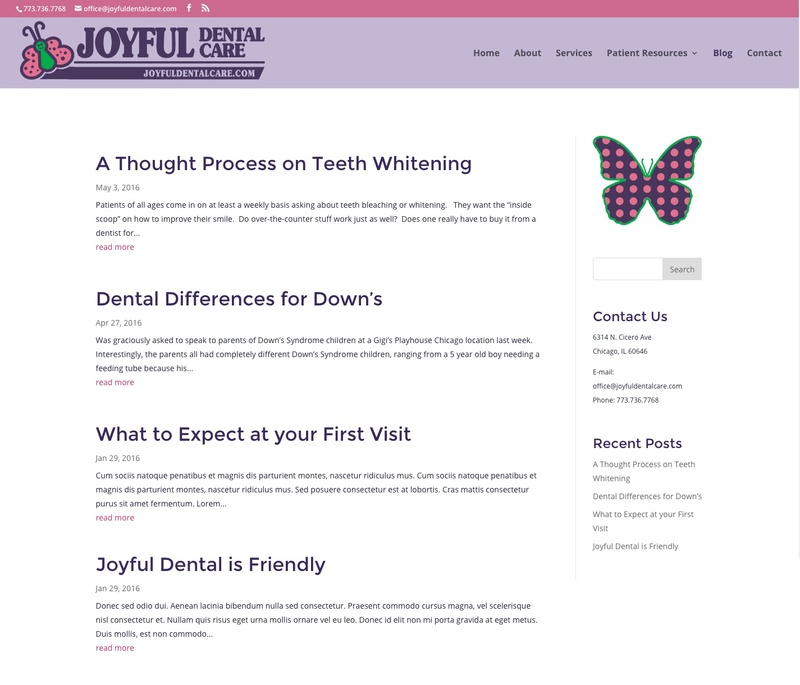 Joyful Dental’s original website was not mobile responsive, used dark colors, and was text heavy. The blog Dr. Poskozim had created for her patients was on a separate site, which was not helping in the search engine optimization of the site and created more work for her in having to switch between platforms to monitor the website and the blog. While setting up the WordPress website, Sparkfactor went to Dr. Poskozim’s office on the northwest side of Chicago and photographed a Google virtual tour. The tour not only allows current and potential patients to see the office, making them more familiar and comfortable with the space, but it also allowed Sparkfactor to pick from still photography for the website. 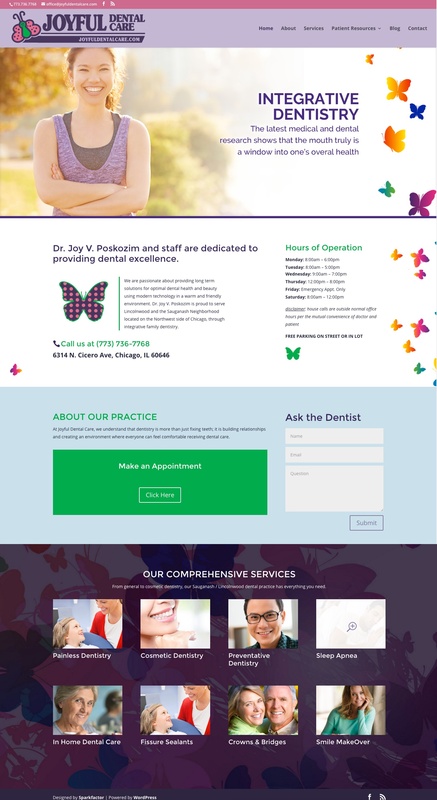 It was very important to add imagery to the Joyful Dental site, to tell the story of the business and create as welcoming of a website as Dr. Poskozim’s practice is to patients. Stills from the Google shoot and stock imagery come together nicely on the new website to convey Joy’s passion for her patients. In addition to hosting the website on WordPress, the blog is now also on the same platform as the rest of the site. This makes it much easier to make updates to the site and to the blog using WordPress’ content management system.